Any job where there is frequent ladder use. If you have ever used a ladder, you know just how easy it can be to slip off a ladder rung if you're wearing the wrong kind of footwear. Construction jobs, where tall ladders are often used, can therefore be extremely risky unless workers purchase safety footwear which includes a defined 90-degree heel (these sharp heels provide better stability on ladders). Ideally, footwear used on ladders should also include ladder grips or ladder locks built into the sole. Welding jobs. Because of the extremely high temperatures welders are exposed to while working, they must choose special fire-resistant safety footwear. Welders should look for boots which can be pulled on (i.e. wellington safety boots) or which have a guard placed over the laces so that they cannot be set ablaze by flying sparks. The outsoles of welders' protective footwear should also have a very high heat rating; these special outsoles usually contain either nitrile or Kevlar. Electrical work. When in need of safety trainers UK electricians should look for safety footwear that is Electrical Hazard (EH) rated. 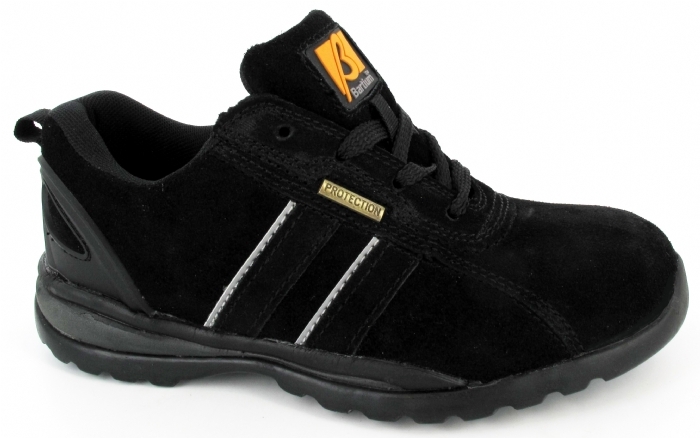 Black safety trainers purchased for work where there is a risk of electric shock should be non-metallic and non-conductive so that the wearer cannot complete the electric circuit to the ground and sustain a shock. Stay away from Electro-static Dissipating (ESD) shoes as these type of trainers actually allow current to pass through them. Building and construction jobs. Construction sites often contain both heavy objects and puncture hazards (e.g. bits of metal, nails), making safety footwear a must for any builder. Look for boots which feature a steel toe and a puncture-resistant outsole (a type of outsole which includes a plate between the insole and sole of the boot for added protection). Any job where there are wet or slick conditions. If your place of work has floors which are regularly wet or oily, you will need to seek out non-slip footwear. Non-slip footwear typically includes outsoles made from sticky, grippy rubber which feature a number of channels, ridges and depressions to divert liquid away from the bottom of the shoe or boot. As a final note, it's important to remember that even if you are a manager or company official, you may still need to purchase safety footwear. If you tour, supervise, or visit environments where hazards are present, it's essential that you protect your feet accordingly.